Womanism serves as a response to the exclusion of marginalized communities form the mainstream feminist movement. Womanism, for me, is the true way to advocate for the legitimization of all types and interpretations of womanhood (and manhood) in our civilization. This article chooses to highlight a character in television, print, or film whose fictional journey embodies womanist mandates and principles. Living Single portrayed the professional, romantic, and social lives of four women: Khadijah and Synclaire James (cousins), Regina "Régine" Hunter, and Maxine Shaw. Although Khadijah, Synclaire, and Régine lived together in a New York brownstone across the hall from two gentlemen, Overton Wakefield Jones and Kyle Barker, Maxine basically was their fourth roommate, as she was over ALL THE TIME, eating all the food and cracking all the jokes especially towards her foil-turned-love interest Kyle. Maxine Felice Shaw herself was a damn good attorney at law, choosing to follow in the footsteps of her mother (played in one episode by the awesome CCH Pounder, and by Jove if your mother is played by CCH Pounder you are destined to be great). Max later chose to run for public office under the ever hilarious campaign motto "Ride the Maverick". Why was Max a Womanist character? 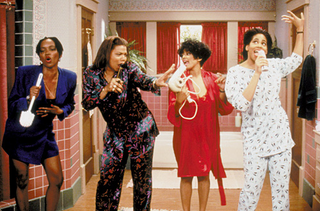 It is difficult to highlight just one character from Living Single as being Womanist. To fail to mention the messages of Womanism promoted by Living Single, including the emphasis on female sexual and professional autonomy, the representation of Black excellence in the midst of negative stereotypes of the Black diaspora, and the importance of women standing in solidarity with one another, would be an error on my behalf. This article may be coming from a sense of bias, however, because Maxine Shaw was by far my favorite character on the show. Max was different to me. I felt her distinctiveness even when I watched the show during it's original run as a youth and in syndication during my high school years, but I couldn't put my finger on why she stood out. I can now articulate Max's impact as a forceful disruption of the stereotypes* imposed on women, particularly those directed at policing and defining black womanhood. Max did not conform to the four cardinal virtues of piety, purity, submissiveness, or domesticity required of White women, nor the stereotypes of obediency, neglectfulness, hyper-agressiveness and sexual deviancy expected from Black women. This is not because she avoided sexuality or confrontations or kindness, but that those limiting classifications of womanhood established by a racist patriarchy did not define the totality of her being. Max was the block braid wearing, little black dress stuntin', quick to put anyone in a verbal vice grip but would show you kindness and have your back when times get rough type of woman. Her interactions with Kyle firmly established Max's refusal to be submissive. She was outspoken, but not on accident. She didn't stumble into her wit, unlike other stereotypical representations of comedic woman characters as having to be "neurotic" or "weird" a la Myra from Family Matters, Phoebe from Friends, Jess from New Girl, Hannah from Girls, and even Living Single's own Synclaire. Maxine Shaw was very important to my self-identification as a Black Woman, and how I carried myself on several planes of existence. *It is a legitimate claim to classify Max as a "Sapphire" like character who is portrayed as emasculating Kyle and displaying other characteristics similar to the "Angry Black Woman" stereotype. This is an important counter-argument against considering Max a Womanist character, for in order to improve the representation of marginalized communities in media/art, we must examine even "positive" instances of diversity with critical eyes. However, considering the origin and content of the show (created by Yvette Lee Bowser, led by a Black female cast, the overall themes of female agency), and the personal influence Living Single and Max's character had on me, I felt it appropriate to classify Max's storyline as aligning with the values of Womanism.